We made so many memories during our #30daysinalaska adventure. 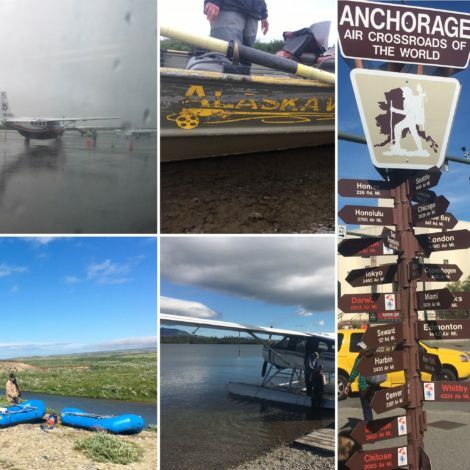 We visited and fished four different regions of the state, with Anchorage being our “home base” where we usually spent a day or two before heading off to our next stop. Our first lodge experience was at Intricate Bay Lodge (IBL) on Lake Illiamna. This area is part of the Bristol Bay area of Alaska which includes many different rivers and lakes. Our week at IBL was an amazing first trek during our time in Alaska and included fishing 5 different rivers…. Copper, Alagnak, Gibraltar, Battle and Moraine Creek. We experienced fly out fishing in sea planes guided by our pilot and his plane “T-Bird and the Dirty Girl”. While we had many highlights along our trip to this region, which also includes Katmai National Park, one of our favorites was our “Guide Talk” with the guides of IBL. After flying back into Anchorage, we ventured up toward Denali National Park, home of the tallest peak in the US. We were very lucky to actually get to see Denali right before we dropped into the little village of Talkeetna, which was the setting for the TV show Northern Exposure. In Talkeetna, we found great food, quirky shops and some awesome music. Nearby, we also found Montana Creek, which was one of the spots we fished without any guide, which is always interesting for two reasons; 1…. we were on our own in serious bear country, and yes, we carried our own bear spray and, 2… we used our own wicked smart fishing skills (chuckles) to find good holding spots for fish… picked our own flies to use… and yes, caught fish, including our first Chum! Our third week in Alaska found us traveling to the small native village of Quinhagak, then jet boating up the Kanektok River to our tent camp at Alaska West. If I had to pick one river that was simply “lights out” awesome fishing of all of the TU Top 100 Trout Streams, it would be the Kanektok. We had a blast exploring this river from where it flowed into the Bering Sea all the way up to where Togiak Wilderness Area begins. We fished the main channel and the braids targeting species from salmon (Silvers, Chum, Pinks, Kings and Sockeye), to Rainbow Trout, Dolly Varden and Grayling. While the scenery in the area was breath-taking, it was the fishing that was the big draw. We held our largest “Guide Talk” on the last evening in camp that turned out to be a hoot. Our last week in Alaska was on the Kenai Peninsula where we were joined by fishing buddy James Kelley. Guides from both Alaska Troutfitters and Mystic Waters Fly Fishing showed us the Kenai, Russian and Quartz Creek. Wading the Russian and Quartz, watching for bears and picking off rainbows and dollies along the way was just exhilarating. The Kenai was just so impressive with its size and color which is caused by the glacial silt in the water. The pictures you see in our “The Last Frontier” video aren’t doctored in any way…. the river is truly that color of blue! We hope you enjoy this “highlight” video of our time in Alaska. We had to pick just a few favorite photos, otherwise the video would be a full length movie! Enjoy…. and…. At almost every turn in Alaska, whenever something happened, we were greeted by the phrase “It’s a part of the ‘Alaska Experience’”. I cannot tell you how many times we heard that phrase… from guides, to airline employees, to fly shop owners, to merchants, to restaurant servers and more. I think it’s part of the lexicon for Alaskans to remind you that you’re definitely NOT in the lower 48 anymore. While I will be writing much more later, I wanted to share just a few of the “happenings” which cause this phrase to be uttered. You’ll note that I’ve included one picture to this gallery post to depict each of these “happenings” that coincide with each of the sections below. When we arrived in Anchorage, it was sunny and 72 with no wind. When we left Anchorage for Intricate Bay Lodge, the clouds had formed and were a harbinger of things to come. At dinner the first night, our host shared how the past week at the lodge, the temps were in the upper 60’s and 70’s with sun and no wind. As it turned out for OUR week at IBL and in the Katmai NP area, we had temps in the low-mid 50’s with winds in the sustained 20-30 mph range …. gusts exceeding 40mph… and rain regularly pelting us. We had one sunny (but windy) day in the Katmai area. 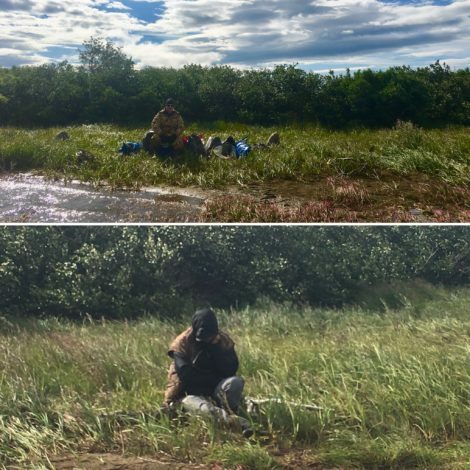 When we went to fish the Kanektok with Alaska West, we had a similar experience, albeit with less wind, but similar rain… and yes, one day of sun! I can still hear Chase at IBL and Cole at Alaska West telling us… “It’s a part of the ‘Alaska Experience!’” Mind you, Chase said it when we were landing at “Pothole” near Moraine Creek in a rainstorm with a ceiling of maybe 200’ for T-Bird to land the Dirty Girl… repeated it as we carried the rafts, coolers, paddles, etc… up and down the ridge to our put in spot…. and then as he fought those sustained 30 mph winds with 40+mph gusts for 7 hours. Cole used the phrase when we arrived at Quinhagak along the Kanektok River in a rainstorm without our rain gear as we were about to embark on a 30 minute jet boat ride upriver to our Alaska West tent camp. We were wearing trash bags as rain gear on our legs, covering ourselves as best we could, which leads me to the next “Alaska Experience” topic. Picture 1 Note: We’d just finished a day long raft trip on Moraine Creek in crazy harsh winds and rain. The knees you see just sticking up are our guides who were exhausted from fighting the wind. Barb is the one all covered up in the bottom of the picture trying to avoid the weather. We waited like this for about 30 minutes before “T-Bird and the Dirty Girl” arrived to pick us up and fly us back to the lodge. You see, we HAD actually packed our rain gear, right on top of our luggage, expecting to get it at the terminal in Quinhagak when we landed. Our plan was to put it on in the terminal before boarding the jet boats for the trip upriver. Great plan…. right? As it turned out, right after we boarded the Ravn Airlines “Nanook” in Anchorage for our flight to Bethel (an intermediate stop on the way to Quinhagak…. more on this another time), a ground crew member came aboard and informed us that several bags had been “bumped” from the flight due to weight restrictions, but that they’d be on the very next flight to Bethel. 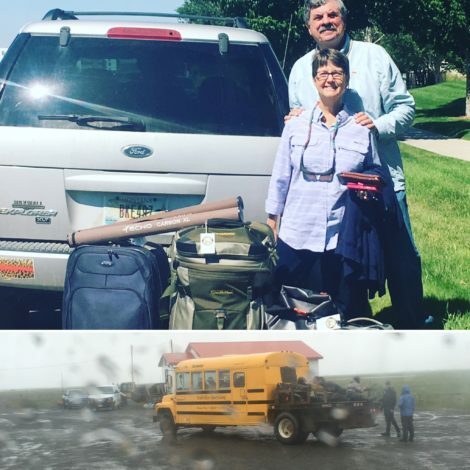 When we arrived in Bethel, after a long delay there due to “Rain and Wind” (see above), we found out that both Barb and I had been the “lucky losers” and our bags had been pulled in Anchorage. No worries however, they were coming on the very next flight to Bethel, then onto Quinhagak. I’ll spare you in this version of our “Alaska Experience”, and just say that our bags DID make it on the next flight from Anchorage to Bethel, but the airport in Quinhagak was closed due to…. you know what…. “Rain and Wind”. We didn’t see our bags, with our rain gear right on top, until noon the next day. Our “note to self” for our next trip to Alaska was…. in addition to carrying on all your medications, passports, toiletries and such in our carry on luggage, pack full rain gear as well. Picture 2 Note: The two “big” bags in the top 1/2 of the picture are the ones that got “bumped” from the flight. The bottom 1/2 of the picture shows the bus and trailer that is holding all the bags that DID make it on time to Quinhagak… as well as the rain that was coming down at the time. First of all, just getting to Alaska isn’t the easiest of things to do…. but once there, the REAL fun begins. Alaska is known as the “Air Crossroads of the World” due to the number of flights that occur daily, including all the sea plane flights. Since there are only a few roads in Alaska, most travel is done via plane. Each small village, many of which are native Alaskan villages, has an airport. If you look at the Ravn Airlines map, you’ll see just how many destinations there are in Alaska. Ravn operates 10 “hubs” for flights to all the villages it serves. Even more so, this doesn’t take into account all the private float planes stationed around the 3197 “officially named” lakes (and 3 million+) lakes that dot the landscape of Alaska. So…. the “Alaska Experience” of course includes jets, prop planes of assorted sizes and for sure, float planes including our fav, the “Dirty Girl”. In addition to planes, there are also rafts, drift boats, jet boats and a bit larger boats for tooling around the waters of the state. We were even introduced to a new aviation moniker…. IFR flying. When the ceiling is incredibly low, you go IFR…. I Follow River! We came to think of it as an amusement ride, banking left and right as you parallel the river below, only about a few hundred feet up. I have to say, the jet boat rides were an adventure as well, with that same amusement ride feel to them. We traversed some landscape that you wouldn’t have imagined navigating by just looking at it. Picture 3 Note: Just a few of our transportation adventures during our “Alaska Experience”. Yes…. 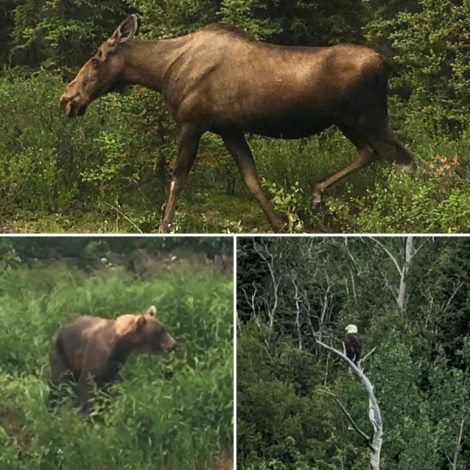 there is wildlife in Alaska… lots and lots of it. At times, we would have to remind ourselves of where we were to remember what we might encounter. While in Anchorage, we really weren’t TOO worried about bears, but definitely had to watch out for moose. When we were on the rivers in Alaska, we most definitely had to watch out for bears. Amazingly, we did… kind of…. get used to seeing them around us. We were always aware and looking around regularly, but really weren’t too afraid when we saw one for two reasons. One… the bears had ample supplies of food with all the salmon in the rivers, and two, our guides had both bear spray and carried hand guns, just in case. Our only “sketchy” times were those in which we ventured out to the rivers on our own, without guides. Needless to say, we always had bear spray and we made LOTS of noise along the way. We still saw bears each time we went out, but really never felt too threatened. We also encountered moose and more eagles than you could count. We came to appreciate all of these wildlife encounters as a part of the “Alaska Experience”. Picture 4 Note: The wildlife in Alaska is so spectacular, especially the moose, eagles and of course, the bears. 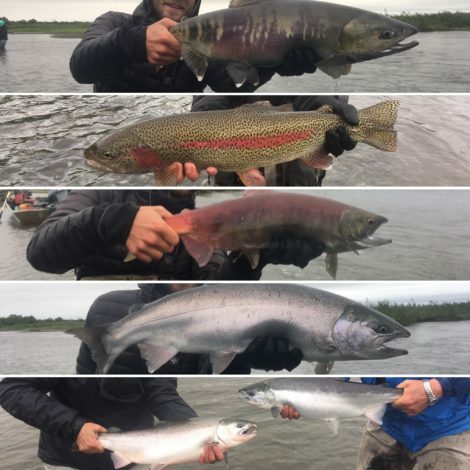 The ultimate reason we came to Alaska was to fish the final 5 rivers of the TU Top 100 book… Kenai, Russian, Copper, Alagnak and Kanektok. That said, we also came for the “Alaska Experience” shared in this post whether we realized it at the time or not. The fishing in Alaska is EPIC to say the least. There are so many species to target…. so many big fish to battle… and so many rivers, creeks and lakes to explore. We had an absolute blast fishing them all and yes, are already plotting our next trip to Alaska in 2020. Picture 5 Note: On our last day on the Kanektok, our guide put us on 6 different species of fish… this pic captures 4 of them… Chum, Rainbow, Sockeye and Silver (Coho). We also caught grayling and dollies that day.